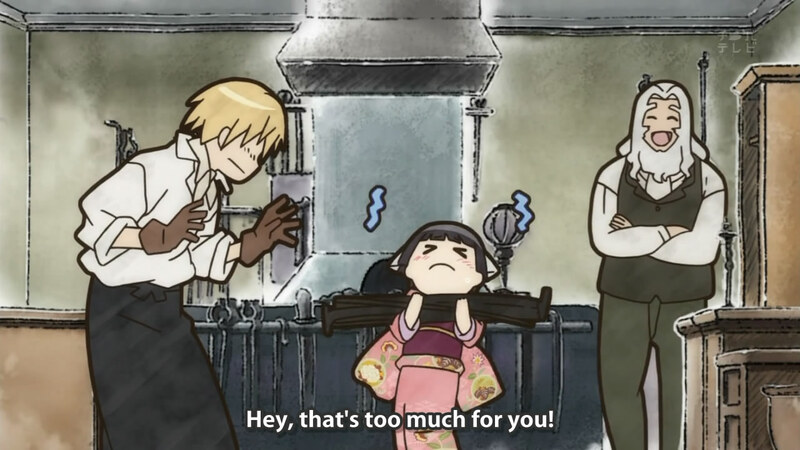 I was putting this off for as long as possible so I could try to forget about the terrible ending, but I realized that was ridiculous - I need to get this review over with so I just forget about this terrible anime all together. 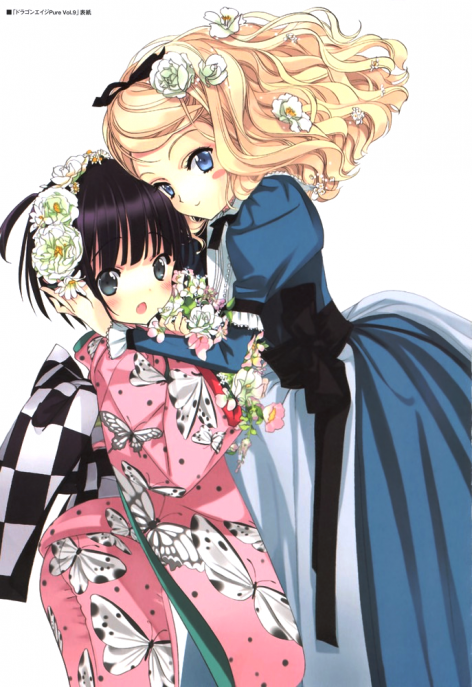 A cutesy slice-of-life done by the same author of Gosick - I was into watching this show after knowing just one of those points. However, the characters were far less likeable than the ones in Gosick and the melodramatic type of ending stayed the same. What a bad combination. There seems to be shipping or something for this pairing. The animation was very detailed. Although I've never personally been to Paris, the details really did make it look like old-school Western Europe. The character designs were very annoying, on the other hand. Almost all of the younger girls were overly cute and super tiny, but the males were very gangly in comparison. Yune very clearly had green eyes but everyone kept saying they were jet black. I guess it would look weird if such big eyes were deathly black, but it was irritating nonetheless. Speaking of eyes, I think perhaps the decision to differentiate ethnicity led to some strange results; Claude had this extra line under his eye (as did any other Parisian), which just made him look like he was sleep-deprived all the time. How old is she? This may or may not be inappropriate. 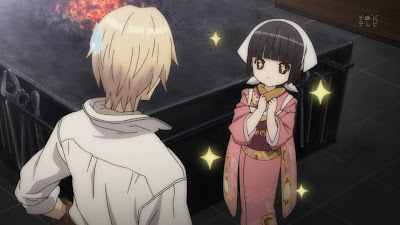 The story, set in the 19th century, of this anime was that Yune, a young Japanese girl, went to France in order to get her stewarding experience (mandatory for her undoubtedly rich family). This is where Oscar, the old man that visited Japan, came in; he brought Yune back to stay with him and his grandson (Claude) at their store/home in the Gallery (basically a shop-filled living quarters). With this out of the way, several pressing questions were never answered. 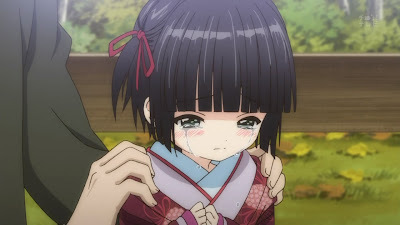 I spent the entire anime wanting to know how Yune's family had sent her abroad, how they knew to trust Oscar, and what status of society she hailed from. None of these questions were answered; several times, when it looked like perhaps a character was interested, it was always swept under the rug (for example, Claude not wanting to find out more about her to keep from getting attached). It was so irritating that I hated the characters even more for their lack of curiosity, which is actually a really bad thing in an anime that's completely character-driven (given that nothing really happened in the way of story-telling). Cute scenes to take your mind off the lack of story. Each episode was routine as though that was the rule. Someone did something that surprised someone else - either a Parisian doing something that surprised Yune, or Yune doing something that surprised the Parisians - and the cultures attempted to mix a little. The lack of understanding frustrated me almost constantly - Claude was very biased and closed-minded - but I can understand that 19th-century France wasn't exactly a cultural mosaic. I'd try to pinpoint some of the themes, but I'm really blanking on anything other than what I just described. 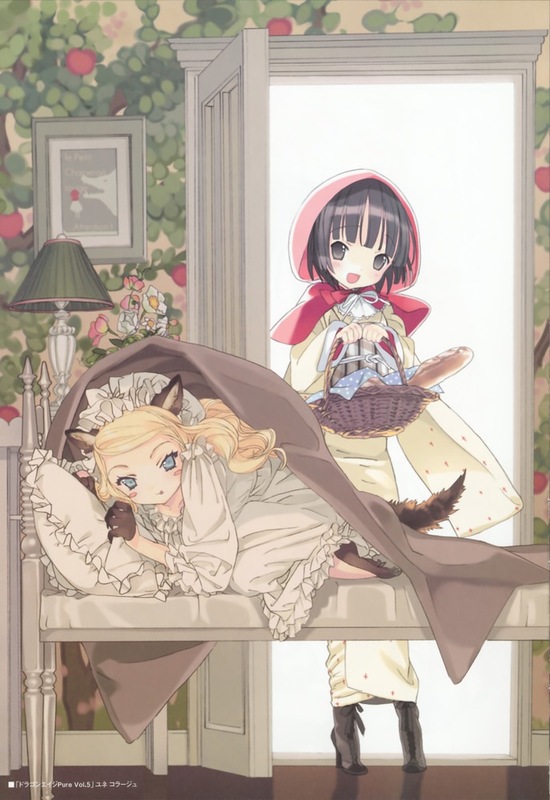 The lack of a deep story was masked by cute scenes, which really grew weary after a while. Overall, it was pretty much a humdrum watch which, while boring, was acceptable - until the final 3 episodes. Suddenly, out of nowhere, back stories came out and the anime attempted to get a more serious feel. Due to a lack of build-up and a forced sense of seriousness, it just felt ridiculous. Alice is a wolf! Run away, Yune! The characters were really not designed well. They were quite 2D and unchanging, which left them to have to talk about their supposed changes (such as Claude's behaviour as the anime went on) in order to press that the characters had changed. All of the feelings were lacking; it's as though these characters were really bad actors. 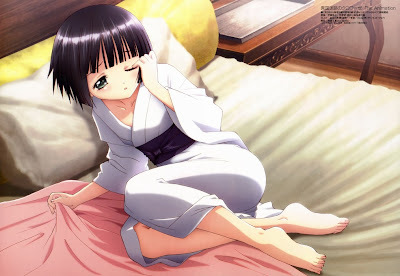 Yune was sickeningly sweet, leading me to just abandoning episodes at some points because I couldn't deal with her. (Could this be the source of Claude's constant under-eye bags?) The worst of all, however, was the fact that the characters never really learned anything from various plot points. Actions rarely had real consequences, and the ultimate moral was always "at least nothing bad happened". It got tiring to watch. Ha, Alice is cosplaying as Alice. I had hopes for this anime, because I liked the concept. It fell apart because, other than that concept, it didn't have any substance. For a character-driven show, the characters were weak and not liked by me; that obviously destroyed a lot of the series, since the lack of story was supposed to let the characters shine. I had no problems with the story-telling; it was direct and to-the-point. Had there actually been a story, I probably would have liked this anime a lot more. 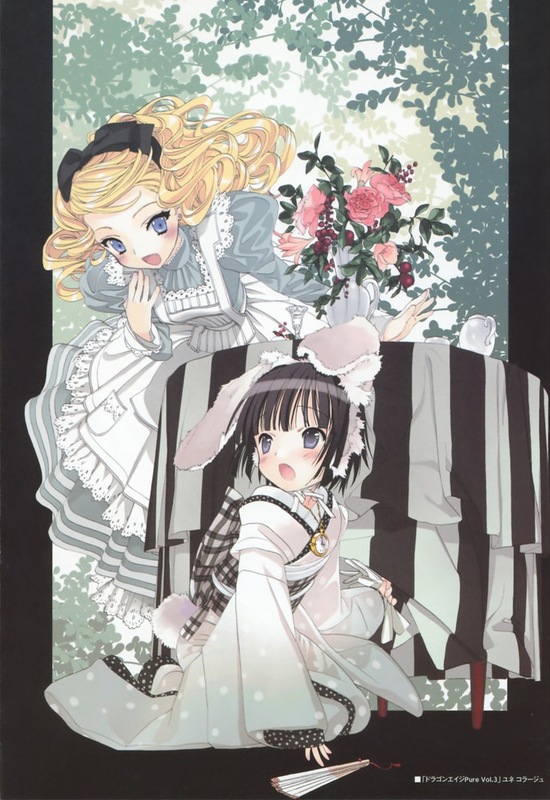 Ultimately, just like Gosick, any reasons for liking this show I had were destroyed by the strangely melodramatic ending (does this author just not do endings well?). Unlike Gosick, the anime had nothing going for it before the crappy ending, so there wasn't any good memories for me by the end of the experience. Most scenes with the two of them had this kind of moment. There was a good start that seemed to have a lot of potential, but the slow pacing and the so-so characters degenerated the overall experience. The characters grew weaker with time due to the lack of changes, leaving nothing that was enjoyable.